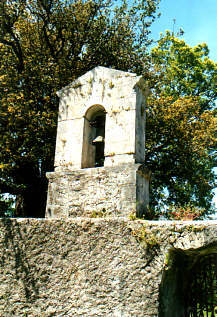 Platystoma is a small and typical Greek village in the inland of Lefkas: a square, a church and some houses. Nothing to tell about. 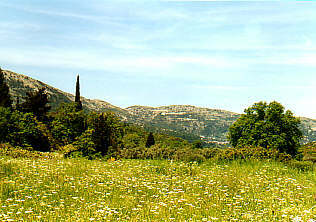 The only reason we named this page Platystoma is that one of our walks started there, in the middle of Lefkas. We had a description for a walking route that would take us from Platystoma, partly over small footpaths, back to our hotel in Perigiali near Nidri. This description proved to be flawed at many places, but we had a nice walk anyway. One of the things we liked best of the landscape here is the abundance of flowers. Along every road you see lots of flowers in a wide variety and in every color of the rainbow. 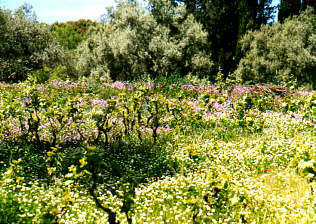 Even in a vine yard you can sometimes see flowers. 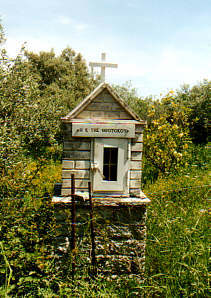 An item you will find a lot, are small chapels like this one, or even smaller ones, made of steel. Inside are icons of saints and a oil lamp. Usually the bottle with lamp oil is kept inside as well. The saints probably don't mind, in a way it is their own oil. The main reason for walking from Platystoma to the coast are the wide views of the landscape, mainly of the islands at the east coast. You can see the city Lefkada to the north as well, and the dam which connects it to the mainland. In brighter weather you can see big parts of the mainland (here only vaguely): that's the reason to go to an island!